You all were a dynamite team! Thanks for trying out our escape room at Lock Chicago! You were all great, thanks for trying out our escape room at Lock Chicago! Thanks for coming to Lock Chicago! We hope you all had fun in our escape room! You all worked like a well oiled machine. We hope you come try our upcoming escape room the next time you're at Lock Chicago! Thanks for coming to Lock Chicago, you all gave our escape room a run for its money! Turnt is putting it mildly! You all puzzled like champions, and we hope to see you try out our next escape room at Lock Chicago! Dream Team coming through! You all were great! Thanks for trying our Escape Room at Lock Chicago! You came, you saw, and you were so close to conquering! Come give our new escape room a try the next time you're at Lock Chicago! Thanks for coming to Lock Chicago and trying out our Escape Room! Nothing like a bit of sequential defeat, am I right? You all were great, and thanks for coming to Lock Chicago to give our Escape Room a try! Close but no cigar! Because we're a non-smoking facility, and we plan to keep it that way! 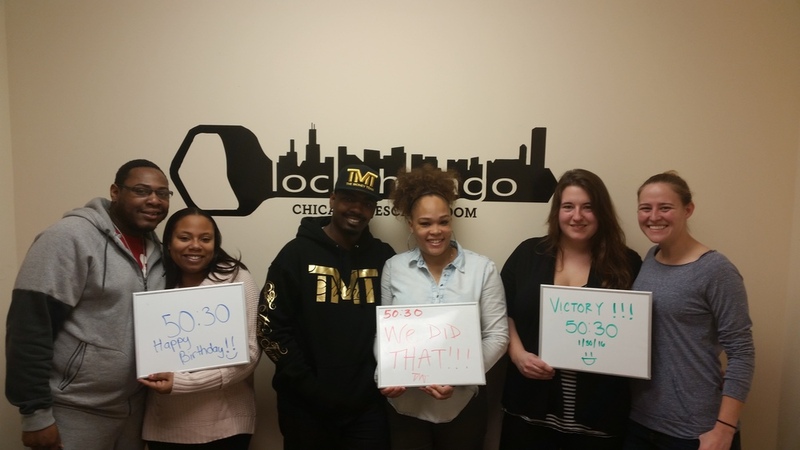 Thanks for stopping by Lock Chicago and giving our escape room a try! Hey, you may be clueless but your team sure knows how to draw some good smiley faces! Thanks for coming to Lock Chicago and giving our Escape Room a shot! Thanks for coming to Lock Chicago and giving our Escape Room a try! Haha your signs are great! Thanks for coming to Lock Chicago and trying out our Escape Room! 3's a crowd, but 8 is a success ratio! As in, only 8 teams out of 70 have beaten our room, and you all were one of them! Congratulations, and thanks for coming to Lock Chicago -- let's see if you can beat our new escape room coming out in March! You came, you saw, and you almost conquered! 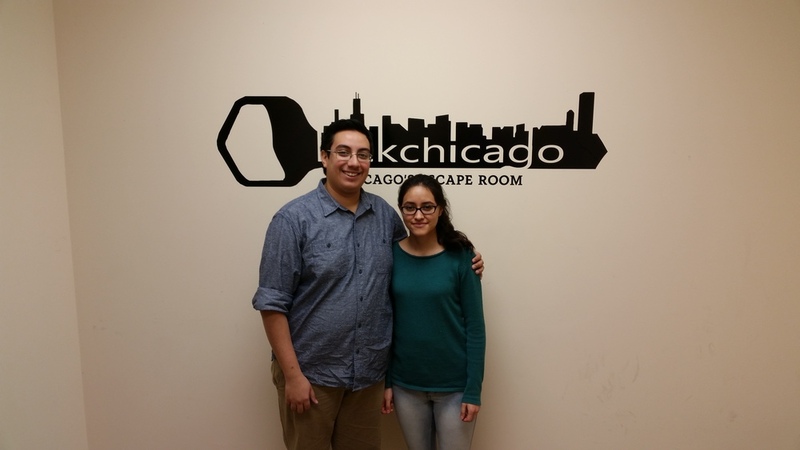 Nice work you two, and thanks for coming to Lock Chicago and trying out our escape room! Thanks for making it out through the cold to get to Lock Chicago! We hope you come try out our new Escape room in March! You puzzled your way into our hearts! Thanks for coming to Lock Chicago and giving our escape room a try! The only thing sharper than those glasses is your puzzling skill! 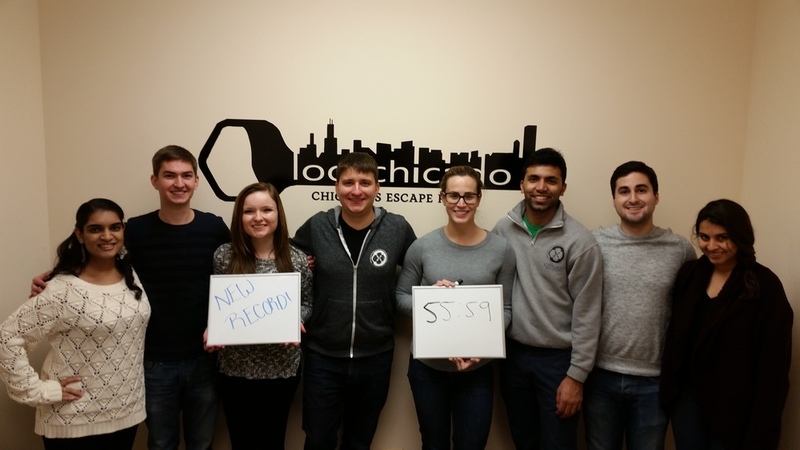 Thanks for coming to Lock Chicago, and we hope you come try out our new escape room soon! We hope you all enjoyed yourselves at Lock Chicago! Thanks for coming and checking out our escape room! 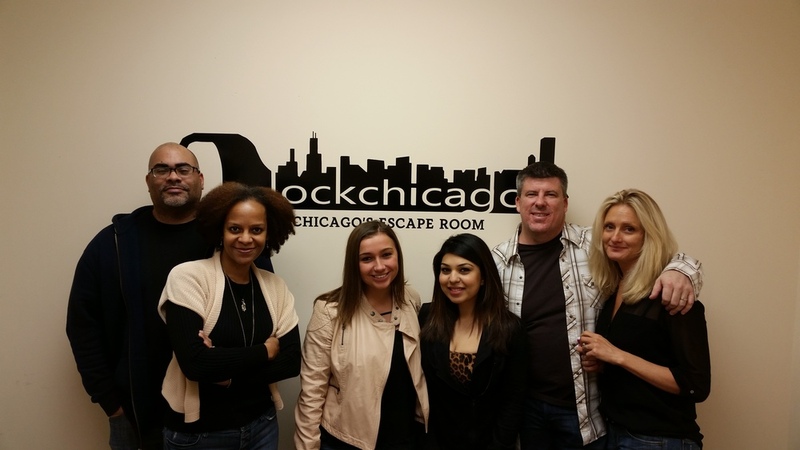 Dynamite team, thanks for coming to Lock Chicago, and come check out our new escape room in March! Happy birthday Brad, and thanks for stopping by Lock Chicago for your birthday! You guys gave our escape room a run for its money! Thanks for coming to Lock Chicago! You all were a great team, and you really knew your way around our escape room! You conquered the towers and came away with a bit of treasure, way to go! 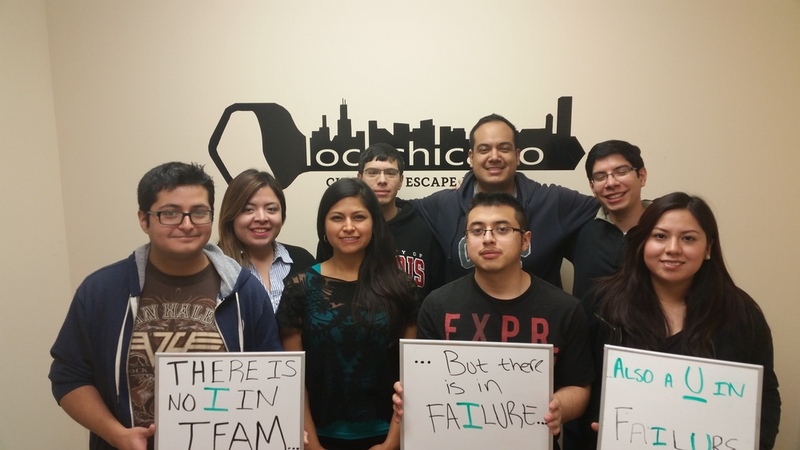 We hope you come to Lock Chicago again and try out our new Escape Room in March! A great team! Thanks for coming to Lock Chicago and trying out our escape room! Way to go you two! We hope to see you again at Lock Chicago for when we open up our next escape room! You came all the way through the cold to Lock Chicago to try our escape room, and you all did great! Thanks for giving us a shot! 8:31 left! We couldn't believe it! You all blew away the competition, and have earned a rightful place on the wall of victors! Thanks for coming to Lock Chicago and we hope to see you again when we release our next escape room! A dynamite team! You all were great, and worked like a seamless timepiece. Seriously, you did us all proud. Thanks for coming to Lock Chicago, and wee hope you come try out our new escape room soon! Thanks for coming to Lock Chicago, and we hope to see you again when we release our next escape room! A huge team outing, and we're glad you all are smiling! Thanks for coming to Lock Chicago, and we hope you come again to give our other escape room a shot! Great teamwork you all! That's definitely the way to attack an Escape Room, and you all were so close! Great teamwork-- another 99%-er squad. Thanks for coming to Lock Chicago! We're glad you chose to have your first escape room experience with us at Lock Chicago! You all did so well, and we hope to see you again soon! If there was a way to say you unlocked the treasure without actually doing it these ladies would have that honor - 99% complete definitely one of our best teams yet at Lock Chicago!! So close to beating the escape room, thanks for coming! 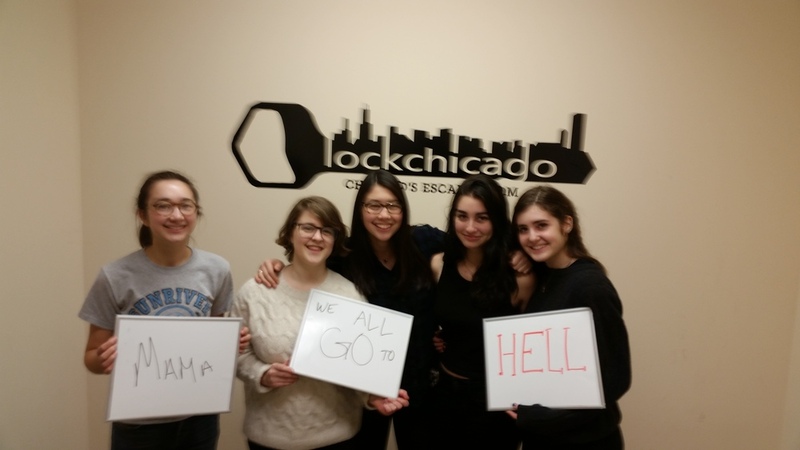 The team from the Depaulia came to check out Lock Chicago, and they were so close to winning! Just a few more puzzles stood in-between them and the Escape Room treasure! Happy birthday Andrea! You were Lock Chicago's first official customers, and we hope you all had a lot of fun! Thanks for stopping by! You all were so close! Thanks for coming to test Sunburn with us at Lock Chicago. All you needed was 5 more minutes! You all just made it under the hour, congratulations on beating the room! Let's see if anyone can beat your time of 59:20! Thanks for coming to Lock Chicago to celebrate your birthday in our Escape Room! You all were real close! Thanks a lot to the residents from Rush for coming down to challenge Lock Chicago for their team building retreat! Two teams challenged each other for Escape Room supremacy, but only one came out on top, We hope the winners went easy on the losers! The first group of two to come from the A&O at Northwestern. Thanks for coming to Lock Chicago! A little friendly competition goes a long way! Your sign is morbid, but you all still did great! Thanks for coming to Lock Chicago as strangers and leaving the escape room as puzzlers-in-crime! Awesome shirts and an awesome group! Thanks for stopping by Lock Chicago and challenging our Sunburn Escape Room! Thanks for weathering the cold and coming to challenge our escape room at Lock Chicago! You all were great! THEY BEAT THE RECORD! We have the new rulers of Lock Chicago, who beat the escape room with 2:44 left on the clock, beating the previous time of 58:50. Who can rise to the challenge and beat their time? You all were awesome! Another group of strangers who worked together like a dream team in the Escape Room. Thanks for stopping by Lock Chicago! The second group from Northwestern A&O. Thanks for coming to Lock Chicago and we hope you make it back for our second Escape Room in March! These guys were right on the edge! Thanks for coming to Lock Chicago. Check out his fresh mixtape. 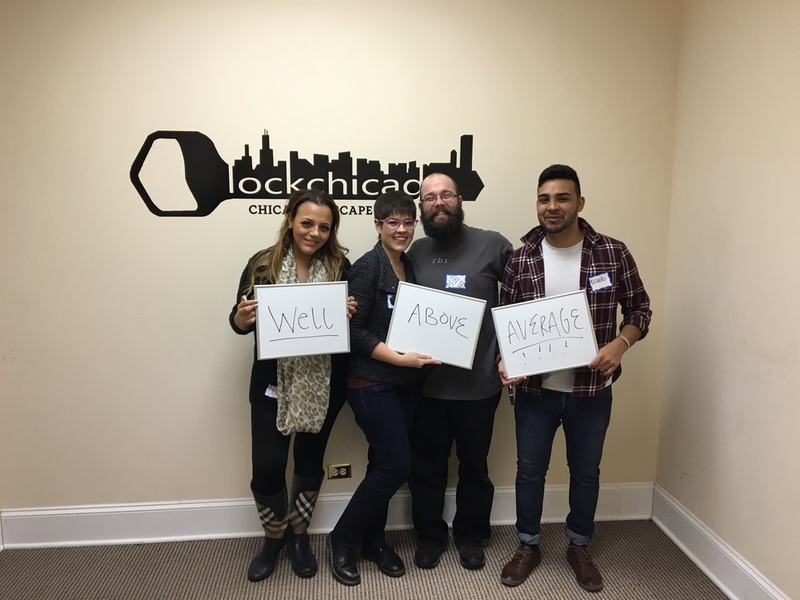 We at Lock Chicago think you're way well above average!! You all did a great job working together to solve Sunburn. Can't wait to show you our next escape room! Thanks for weathering the cold to come try out the Sunburn escape room at Lock Chicago! We hope you all had a blast! Happy Birthday Chrissy! Thanks for spening it challenging the escape room here at Lock Chicago! Thanks for coming to Lock Chicago and trying out our escape room! You all blazed through the puzzles and didn't even use a hint until you were halfway through! If you had five more minutes you would have had it! We had some veterans in today and some first-timers joining forces to try and topple the Sunburn room. They were just 2 puzzles away from getting their hands on the treasure! Thanks for stopping by Lock Chicago on such a snowy day! 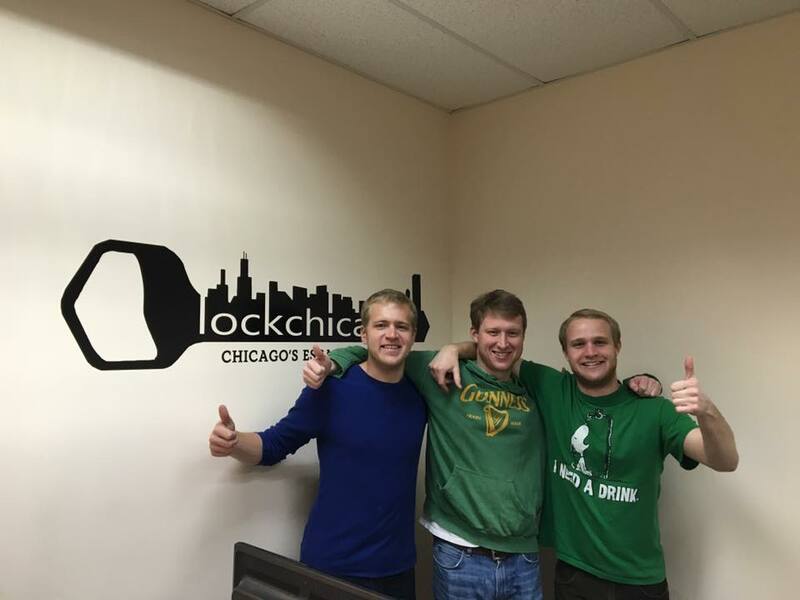 Thanks for stopping by Lock Chicago today! You may not have all known each other coming in, but you started working as a team seamlessly and made it really far! Thanks for coming out to Lock Chicago! The three brothers got out with a time of 58:40!